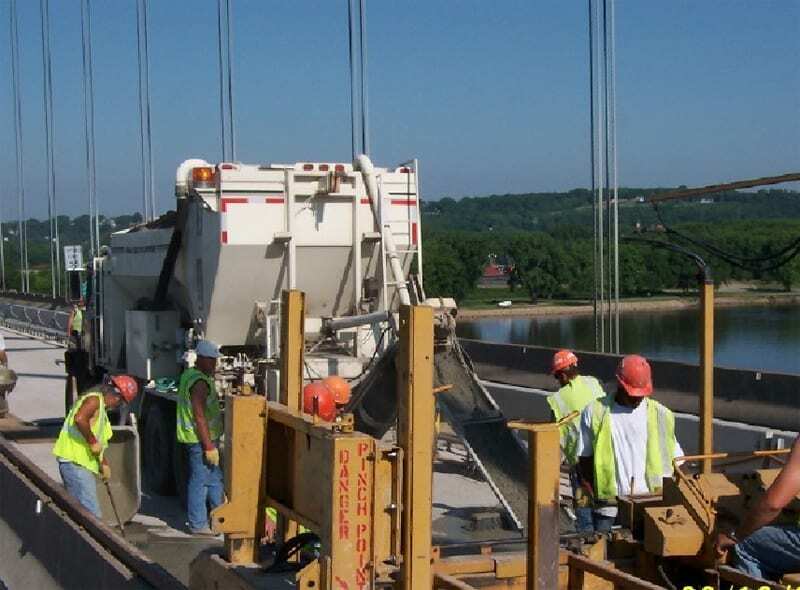 A popular use of mobile concrete mixers is to produce high-quality concrete mix designs that are used to overlay bridge decks (latex modified concrete). These are structural components that contain an immense amount of reinforcing steel. In colder climates, bridge decks go through a more severe freeze-thaw cycle each year than other types of concrete infrastructure. This is because they are exposed to the weather on the top side and the bottom side unlike sidewalks and other concrete flat work. Citizens expect highways and bridges to be cleared of snow and ice shortly after a storm subsides. This caused highway departments to use salt based de-icing materials on the surface to meet this want. If there were cracks in the concrete, this would allow these deicing salt materials to reach the reinforcement steel below which would cause it to rust. Rust occupies more volume than iron, which caused the bridge deck to deteriorate due to the expansion of the rust. Highway engineers now required a long lasting material that could repair the damage and prevent deicing salts from reaching the reinforcement steel. In the 1960’s, Dow Chemical developed an overlay concrete material that used a latex modified concrete. 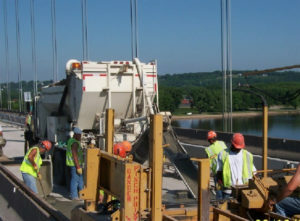 Laboratory studies showed potential for the usage of the resulting concrete for bridge decks. Field testing demonstrated that “conventional” concrete delivery systems provided underwhelming results. After this, someone at Dow decided to try the newly patented and manufactured mobile concrete mixer called the “Concrete Mobile.” This mixer gave engineers control over their concrete production on the job site. The latex modified concrete was now capable of reaching the potential shown in the laboratory studies. All specifications from that period on, require the use of an on-site mixer to produce a latex overlay. Another method of latex modified concrete overlay is known as the “Hi-Density” or “Iowa Low Slump” overlay. As the name suggests, it was developed in Iowa in the 1970’s. The mix is a high cement content mix with a low water-cement ratio. Maximum water-cement ratio is .32 and slump is specified as plus or minus. This high cement content, low slump mix was not even tried in conventional delivery equipment as it would set up in the mixer without adding additional water. This mix competes with the previous latex modified concrete overlay in terms of performance. Producing this mix requires the use of a mobile mixer at the job site so the mix is fresh. Again, this will allow engineers to achieve actual field performance that matched the performance observed in the laboratory. Both of these mixes are highly engineered. 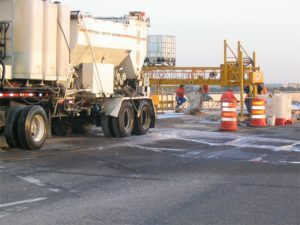 A mobile mixer at the job site eliminates the downsides of age of concrete, tempering water, revolutions of the drum, and more that are associated with conventional concrete delivery systems. Concrete engineers are able to reproduce concrete in their laboratory tests with help from job site produced concrete which is possible, thanks to a mobile concrete mixer. Cemen Tech volumetric mixers are the perfect partner for latex modified concrete, producing the exact mix design every time and meeting DOT specifications. If you have any comments or questions about the different types of latex modified concrete, bridge decks, or mobile concrete mixers, we would love to hear them! Call us at 800.247.2464 or send us a message on our contact us page.